Vietnamese New Year or Lunar New Year is coming. We would like to inform you that our office will be temporarily closing from Feb 06, 2016 to Feb 14, 2016 due to Lunar New Year 2016 (TẾT 2016). However, we are still contactable during the holidays for your inquires. 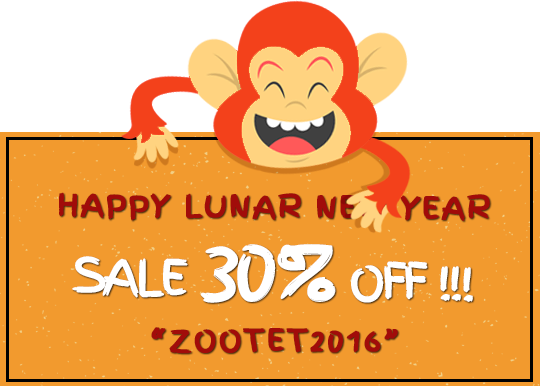 ZooTemplate family would like to extend a very happy new year 2016 to all our customers, business partners. We wish you have a wonderful and healthy time with family, friends, near and dear ones. Vietnamese New Year, also called Spring Festival, has more than 4,000 years of history. It is the grandest and the most important annual event for Vietnamese people. 2016 is a year of the Monkey according to the Vietnamese 12-year animal zodiac cycle. Other Monkey years include: …1944, 1956, 1968, 1980, 1992, 2004… If you were born then you’re a Monkey. Each Vietnamese zodiac year begins on Vietnamese New Year’s Day. Time for Family Reunion: Being one of the traditional festivals, it is the time for the whole families to reunite together, which is similar with Christmas Day to the westerners. Joint Longest Public Holiday in Vietnam: In 2016, most Vietnamese will be off work 9 days from Saturday, February 06 (New Year’s Eve) to Sunday, February 14. Vietnam Highlights’ office will be closed during this period, and we will be back at work on Monday, February 15, though you can still reach our help desk system. Sale 30% off for any membership package!